My family and I try to eat healthy to ensure that we get the vitamins we need through our meals. However, sometimes I feel we don't get adequate vitamins and iron naturally and need to take supplements. 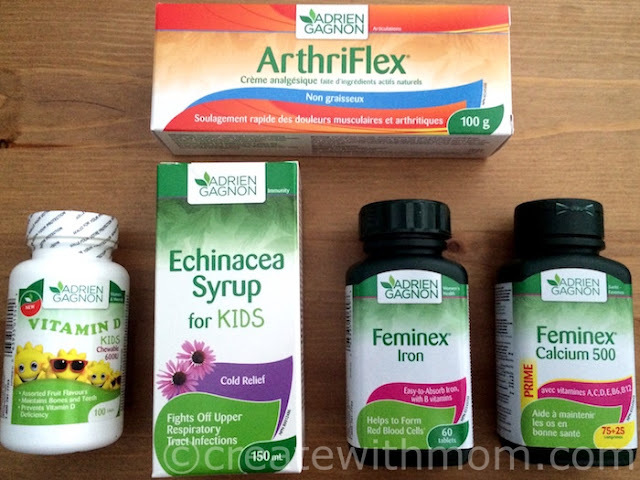 Recently, we have been trying a few of Adrien Gagnon natural health products. In the past, I have used Echinacea Syrup for Kids as it helps relieve the symptoms and shorten the duration of upper respiratory tract infections. We have used this syrup because it has Echinacea, a traditional remedy well known for its effects on colds and recognized by many as effective at reducing the severity and duration of cold and flu symptoms, as well as other upper respiratory tract infections such as cough and tonsillitis, bacterial and viral infections. With young children it is best to always consult a healthcare practitioner prior to using. Since we don't get sufficient vitamin D, in the winter the pediatrician has recommended that we need this vitamin to help in the development and maintenance of bones and teeth. This vitamin helps in the absorption and use of calcium and phosphorus. Adrien Gagnon has Vitamin D 600 IU for kids in assorted natural flavours: orange, banana, fruit punch. Feminex Calcium 500 mg helps normal development and maintenance of bones and teeth, as well as prevention of bone resorption (loss) and osteoporosis. Feminex Iron helps correct iron deficiency and prevents anemia, fatigue, shortness of breath, and pale skin tone. During menstrual periods, women tend to loose part of their iron reserves contained in their hemoglobin unless blood loss is minimal. Since a normal diet does not usually compensate for the body's loss of iron a supplement such as Feminex Iron is supposed to help. Adrien Gagnon Feminex Iron is made from an organic source of iron called iron gluconate, which does not provoke constipation. It mentions that since this Iron supplement contains B Complex vitamins it contributes to fight against fatigue and depressive tendencies. We have been using the ArthriFlex Cream, which is a natural analgesic cream that is not greasy. It does have a strong scent, which fades off. We felt that it helps rapidly relieve arthritic pain, calms stiff and sore muscles, as well as eases chest cold discomfort. This cream is supposed to help with Arthritis, Rheumatism Muscle stiffness, Sciatica, Bursitis, Lumbago, Back pain, Sprains, and Bronchitis. Adrien Gagnon products have NPN (natural product number) approved by Health Canada. The medicinal ingredients have been analyzed regarding their efficacy, quality and safety. When choosing vitamins, I am always more concerned about the non-medicinal ingredients that are used. When I asked the company, they mentioned that these non-medicinal ingredients are chosen from the list of ingredients authorized by Health Canada that has already been studied and considered safe for Canadian citizens.